The Despicable Me franchise has officially reached that point in its life where it doesn’t have any idea where to go next and so it begins digging into the main characters past to try and come up with characters to fill in roles they have yet to address. You’ve seen it before in countless films whether it be something along the lines of Austin Powers in Goldmember or even something as wacky as the Fast & Furious franchise that can’t help but to keep bringing people back and connecting them in unforeseen ways. With the inevitable Despicable Me 3 the folks over at Illumination animation have decided to take this route and approach their film as if Gru (again voiced by Steve Carell) fell into something of a Parent Trap situation, but the two never ended up going to summer camp together. 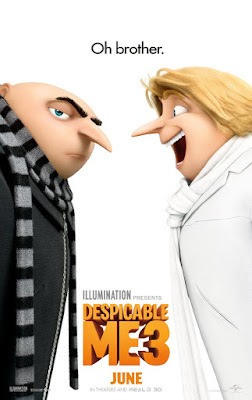 Instead, it is after the passing of their father that his long-lost twin brother, Dru (also voiced by Steve Carell), contacts the newly married and newly heroic Gru in order to connect and maybe try to pull him back into his old ways of villainy. It’s a fine enough device, I guess, and it mostly works because Carell’s voice work is so amusing in how he slightly differentiates the two and then has to subsequently voice both Gru and Dru doing impressions of one another in what is arguably the most entertaining and genuinely funny scene in the movie. If any other scene in the film had a hint of the kinds of layers or even this kind of wacky creativity in the sense of trying to accomplish something due only to the fact it presents an interesting challenge then the film as a whole might have in fact been more interesting, but as it is Despicable Me 3 is more of the same, but busier. Busier in that it wants you and the children you’re presumably taking to the theater to think there is a ton of stuff happening on screen when in reality all you’re seeing is a collection of disparate scenes strung together by the standard objective of attempting to steal the biggest jewel in the world. That said, Despicable Me 3 doesn’t really have to be anything more than what it is as it is just funny enough and just consistently colorful enough to feel like the shiny new product it needs to be in order to please the masses who will spend their hard-earned money on it. Gru (Steve Carell) faces off with new foe Balthazar Bratt (Trey Parker) in Despicable Me 3. It’s kind of insane, actually-how many things Despicable Me 3 at least starts and then decides to more or less abandon down the line. For starters, there is the new main antagonist of the film in Balthazar Bratt (voice of Trey Parker) a failed child actor from the eighties who has seemingly refused to let it go that Hollywood dismissed him after he hit puberty and cancelled his show. Having played an evil villain on said TV show titled “Evil Bratt” it seems Balthazar has decided to actually take on that mantle in his adulthood as he is one of a few parties that is after this aforementioned “biggest diamond in the world”. To Parker and the animators credit though, Bratt is easily the best addition and maybe the best thing about this third film in general. Sporting not only a mullet, but a bald spot along with his purple jumpsuit with shoulder pads, parachute pants, and fingerless gloves Illumination does well to capitalize on the recent infatuation with that decade by not only giving Bratt a no doubt expensive collection of songs to jam to, but also feeding into the nostalgia of the parents in the crowd while simultaneously providing something silly for their kids to point and laugh at. Seriously though, the non-Pharrell songs used in the first ten minutes of the movie probably cost Universal their share of the Minions movie returns as you not only get Michael Jackson’s Bad (which was used in the trailer as well), but there’s also Phil Collins’ “Sussudio,” and a-ha’s “Take on Me” for Bratt to utilize in hopes of re-living his glory days. Parker also fits well into that nostalgia factor as younger parents who grew up with South Park or if South Park was a formidable part of their teenage years will be able to have the little in-joke of knowing just how demented Bratt could really get if this animated movie were to go off the rails while on the other side of things Parker just does well to embody the, for lack of a better word, brattiness of his baddie. The problem with Bratt is that he doesn’t get enough screen time in order to flesh out a more creative plan or more of what could have been fun character quirks, but instead directors Eric Guillon, Kyle Balda, and Despicable pioneer Pierre Coffin (who directed the original along with Chris Renaud who is now working on The Secret Life of Pets 2) spread everything so thin in this ninety minute feature that no one actually gets their due-not even the minions. This, of course, is a fault of the writers more than anyone, but as this comes from the writing team of Cinco Paul and Ken Daurio who have essentially penned everything under Illumination’s sun one would think they’d have a better handle on how to better crank these things out. As it is though, Despicable Me 3 feels rather rushed and as a result is the least of these films thus far. Beyond the new storyline featuring Bratt we also come to meet the new head of the AVL (Anti-Villain League) in Valerie Da Vinci (Jenny Slate) who boots out Mr. Ramsbottom (Steve Coogan) for no other reason than to fire Gru and Lucy (Kristen Wiig) so that Gru has more reason to drift on over to the dark side once Dru is introduced. I assume they are enlisting Slate for future installments, but who knows-there certainly is no indication of that here other than the fact Slate has been killing it on the voice work side of things lately (Zootopia, Secret Life of Pets, The LEGO Batman Movie). This leads to the fact Gru and Lucy do indeed find themselves unemployed leading to troubles with the minions who, as led by Mel, start a rebellion due to the fact Gru refuses to go back to being a bad guy. The movie then deals Lucy a subplot of trying to better integrate herself with the girls as she is new to the role of being a mother, but Margo (Miranda Cosgrove) kind of gives Lucy a heads up on how to handle things while Margo herself is given a nonsensical story that has something to do with cheese and the marriage traditions that come along with cheese and pigs in Dru’s country called Freedonia. If this wasn’t enough the movie also gives young Agnes (Nev Scharrel) a quest to follow that concerns tracking down a real-life unicorn, but gives Edith (Dana Gaier) nothing to do other than follow Agnes around. It’s a whole weird thing because for as much as that sounds like a ton of stuff is happening there is no real progression on any of these storylines by the time the film hits the one hour mark and there’s only thirty minutes left to tie it all together. It’s a distraction tactic more than anything; getting the viewer invested in all these different strands only for maybe two or three to really have any type of significant payoff. There is literally no coming back around to why the AVL needed a new director or why Margo needed to almost fall into an arranged marriage with a foreigner, but they’re here! What’s even worse is the fact that it’s abundantly clear the creative forces behind these movies are genuinely funny and inventive people because you notice things in the background like billboards for fake movies like, “Gigantosaurus Wrecks,” and it’s charming, but it’s also so spontaneous if not totally absurd in how it’s integrated into the story that one quickly realizes that if they could've harnessed these juices into a concentrated effort this might have felt more cohesive and less sporadic than it ultimately ends up being. Gru discovers he has a long lost twin brother named Dru (also voice of Steve Carell) in this third installment in the franchise. What is maybe the most revealing aspect of Despicable Me 3 though is the fact that the minions are missed more than anything and that is because they dare to split them up from the rest of the story. There is no Gru/minions interactions and even more critical is the fact there are hardly any girls/minions interactions as it was always the dynamic between Gru’s henchmen and Gru’s daughters that kind of provided this fun and unpredictable dynamic that would then propel the plot forward in fun and interesting ways. This time around, the plot substitutes the minions for what is an alternate version of Gru and hopes that by giving the minions a side adventure that sees them breaking onto a Hollywood lot and landing on an America’s Got Talent-type show where they get their time to sing and dance and then onto a prison yard where they again…get their time to sing and dance that audiences will be satisfied. It’s not that I don’t enjoy the minions musical sequences, they’re a good bit of fun, but they feel so disconnected from the main narrative that they are more like intermissions from the actual movie than anything else. Whatever it is the minions are doing rest assured that it has no bearing on anything else that is going on. Also, a lot of minion bum in this one. Like, a strange amount. It isn’t just the minions that are missing from Despicable Me 3 though, but while the little yellow henchmen may prove to be the more noticeable absence in the film what is more jarring the more one thinks about this third movie and reflects on the trilogy as a whole is the way in which each of these have tapered off-becoming less and less like the original that captured the imaginations and money of so many people around the world. That original was a rather unique piece of animation in that it took the whole villain as a hero archetype and gave it enough quirks and enough sweet moments to make it feel refreshing while largely standing out due to a unique animation style and big choices in the voice department. The point being, it felt a little bold and boldness counts for a lot. With the sequel they upped the minion count and slapped a story together that saw Gru still evolving, but mostly through re-purposing the original. With Despicable Me 3 it feels like they’re grasping for straws as far as what to do next with these characters. I mean, if Gru’s dad was this iconic supervillain how did Gru not know who he was if he was supposed to be these great villain himself in the original film? It just doesn’t mesh. And I get it, it’s a kid's movie, it doesn't all have to make sense, but that’s no excuse because children deserve better than this and those making movies for children should appreciate that fact rather than churning out lazily plotted dreck such as this. Early in Despicable Me 3 we get a shot of a pair of clownfish who we take to be a reference to Nemo and Marlin from the Pixar movies just before Gru, Lucy and the minions speed past on their secret agent jet ski’s. It's almost as if Illumination is saying they're zipping past Pixar, but Illumination might want to step back and check themselves before calling out the likes of Pixar as something like Cars 3 could compete with the best of what Illumination has to offer any day of the week. They haven’t earned the right to make such a motion and if Despicable Me 3 is any indication of the direction the studio is going, they never will.